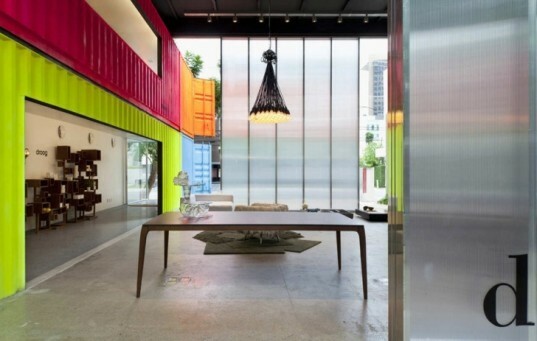 What could be considered the coolest furniture store we’ve ever seen, this design haven by Studio mk27 has been built on electric-colored shipping containers plunked down in the middle of São Paulo's trendiest neighborhood. Stacked two stories high and painted fluorescent colors, the shipping containers were the perfect solution for the client's need to place a low-cost temporary building on their leased property. The containers have been wrapped in a simple two-story hanger whose polycarbonate doors open to create a free-flowing store, or close to create more a intimate space. Located on the last empty lot on ‘furniture row alley’ in the city’s popular Alameda Gabriel Monteiro da Silva neighborhood, the Decameron Design shop required something not just temporary and low-cost, but eye-catching. 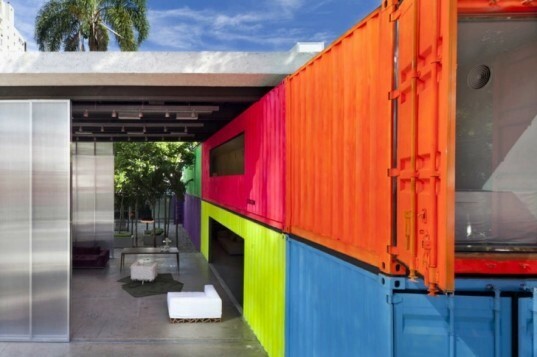 And the vividly painted, reclaimed containers fit the bill nicely. Six containers in total have been stacked two-high and transformed into a gallery to display the furniture, all while providing an excellent and intimate space for customers to approach the wares. The ends of the structure are capped in glass, which have been secured by the containers’ hinged doors. 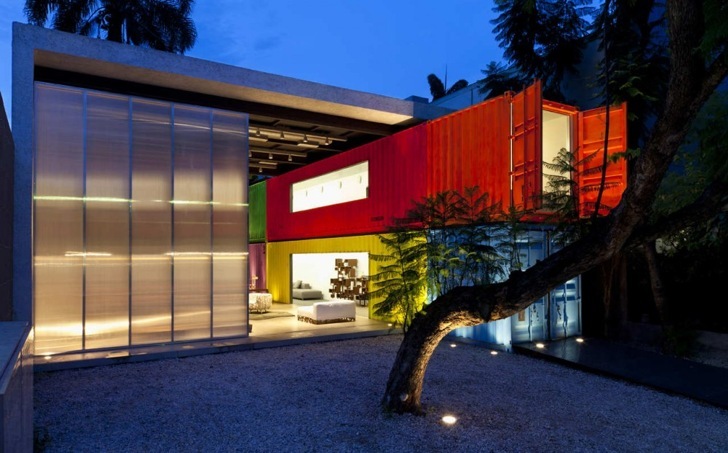 Using an array of bright colors, the architects also managed to emphasize the modular appeal of the design. The central hanger is set up as a casual space where large, double-translucent doors make for an inviting public entrance. The larger room allows furniture to be set in the context of a living space, and in the back a secluded courtyard complete with trees shows off more of the modernist furniture offerings. A stunning creation, sure to excite the masses, the program’s seamless transition of space from an open and vocal design to intimate refined space with minimal materials, is a nifty design trick to be commended. Decameron Design's shop is located on the last empty lot on 'furniture row alley' in the city's popular Alameda Gabriel Monteiro da Silva neighborhood. The vividly painted reclaimed containers fit the bill nicely. Six containers in total stacked two-high are used as a gallery to display the furniture, providing an excellent intimate space for customers to approach the wares. The ends are capped in glass, which can be secured by the containers' hinged doors. The bright colors emphasize the modular appeal of the design. The central hanger is set up as a casual space whose large double translucent doors make for an inviting public entrance. The larger room allow furniture to be set in the context of a living space. The main showroom is gently lit by light via the translucent doors. In back is a secluded courtyard complete with trees and some of the modernist furniture offerings. The courtyard provides a more intimate space for visitors to mull their potential purchase. For those who want to seal the deal, a sales office sits at the back of the lot. The transition from open and vocal design, to an intimate refined space with minimal materials is a nifty design trick done through wide doors. A beautiful and eco-friendly way to brand a store.